Image: Dave Silver - or is that a Bryan Tasaka selfie? Can I do a short race report? Let's find out! After one of the most physically and mentally challenging years of my life, MOMAR Cumberland was like a great big sigh of relief for me. A bad crash in January made for a terrible introduction to XC skiing and a relentless battle with whiplash and concussion symptoms all year long. Many races dropped and a few nervous adventures completed later, I feel as if I am finally over the hump. I can exhale, relax and breathe again. Hurray! I have been able to run long and slow for a while now, but I have not been able to push any activities that involve my upper body or back - ie weights, biking or kayaking - for fear of a flare ups. Three weeks before MOMAR I had to get the lead out and test the waters to find out if I would be able to race this year. So, a few weeks before MOMAR I started riding my bike on the single track again, dodging back spasms and carefully building up some endurance. 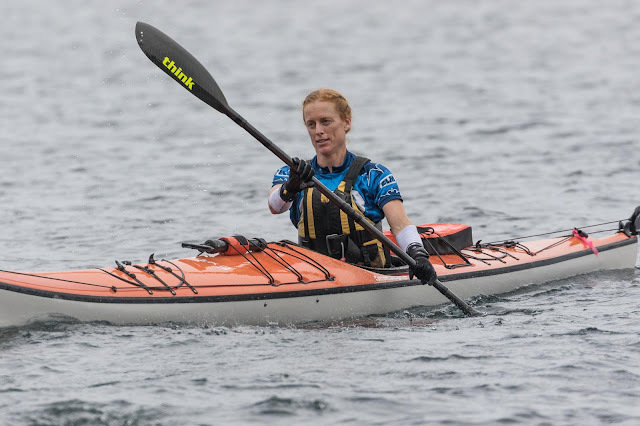 A week before MOMAR I still wasn't sure I would be able to tolerate the race so I finally got my arse in a kayak to test 'the waters' so to speak and although it wasn't pretty (so weak!) it wasn't going to wreck me so I decided I was a go for MOMAR...how could I miss it?...my favourite race of the year! Leg 1: 10k paddle, 1:06ish. Really? I think it must have been shorter this year because that was the fastest paddle leg I have ever pulled off as a solo racer in MOMAR! It was hard, but once I stopped trying to pretend I was a kayaker and surrendered to my actual abilities it was much more enjoyable;). I kept it smooth and steady and my neck didn't get too cranky. Big thanks to Kevin at Ski &Surf shop on 5th street for the pre-race paddling lesson and for letting me demo his Think paddle- it was awesome and saved my hide! Leg 2: 10k? trail run, 1:08ish. When I hopped out of my boat, and bent over to pick it up I experienced a brand new type of suffering - my entire abdominal wall went into a spasm! Yikes! Apparently I WAS using my core out there. Eeesh. Thankfully the kayak zone volunteer was kind enough to help me take my boat up the beach as I was doubled over in a giant cramp and couldn't carry my boat on my own. Onward! Down the beach and then into the Cumberland Lake Crags for a trek up to Queso and then towards town through the bike trails. It was the same start as last year so the CP's were quite simple to pick up. From CP 4 to CP 5 we had a fun route choice to make but it looked to be six of one and a half dozen of the other to me, so I went with my legs and picked the route with the least steep climb. I think it was the faster choice but really, I don't care, because my mind, lungs and legs liked it better so it was the right one for me on the day! From there it was into town, via Riders Pizza for a punch (no time for Za) and then to the transition zone at Village Park to swap out sneakers for helmets and bikes. Leg 3: 20k? bike, 2:11ish. Did I mention it rained for 24 hours the day before the race? Holy mud fest! But first, a nice long climb:) I like climbing! After an extended leave from the single track, I am much less of a hazard climbing than I am descending so I happily put my head down and made circles with the boys for an hour or so. Trick is, I made circles in the wrong direction for part of the route. Yup. We had another route choice to make- up the steeper, shorter road or around Nkkei mountain on the longer, flatter road. I was convinced the shorter route was faster! But, I hadn't actually been all the way around that back road (or either road actually) so I didn't know what condition it was in or which route was truly faster... Well, the back road was a slippery monster truck track with that icky gooey mud that coats your tires and takes you down AND it had some suprisingly punchy climbs just to make the mud a little more ridiculous. When I arrived at the next CP I realized my mistake. Teams that I had passed a while back, had caught up and were right back with me. Ooops! Up the Trent Mainline we went. A million more circles of pain and joy but my back held it together with no threat of spasms for the first time in a long time (yay!). And then...there it was...finally- Blockhead! I have never been so happy to go downhill! The birmed corners at the start of Blockhead got me wooohoooing and I was stoked to be on the descent. It was all downhill from here! Quite a few teams were ahead of me and the trail was an absolute mud fest, however. 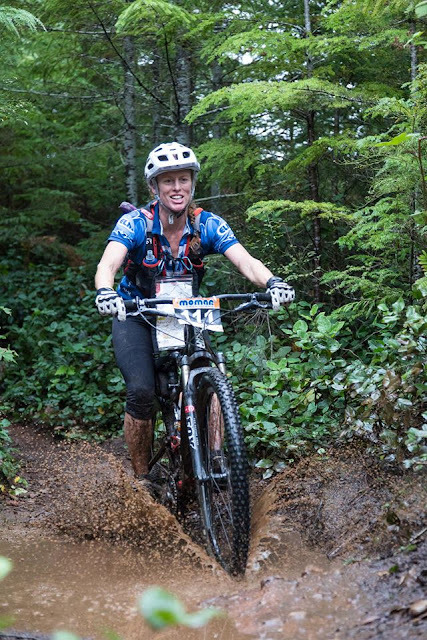 I am so sad when big rains arrive the same time as big bike races because our trails really do take a beating when they are so wet and ridden by the masses. I had to work hard to keep my wheels under me as I slid here there and everywhere- I can only imagine what the trail was like for those pulling up the rear! Blockhead turned to Bear Buns turned to Steam Donkey (did ya'll see the actual Steam Donkey on that trail? ), Teapot and a visit with friends at the final bike CP, then Crafty took us back to the Village Park via some massive, grin inducing puddles...time for one last transition! Leg 4: 5kms? :48 min ish. Orienteering stage. Not only did we get to run and ride on longer unflagged sections requiring route selection this year, we got to play on an actual O Course! A huge thank you goes out to Grant for taking on the task of creating a brand new orienteering map for the Comox Valley! We orienteering geeks are so lucky! What a wonderful surprise! Yippppeee! 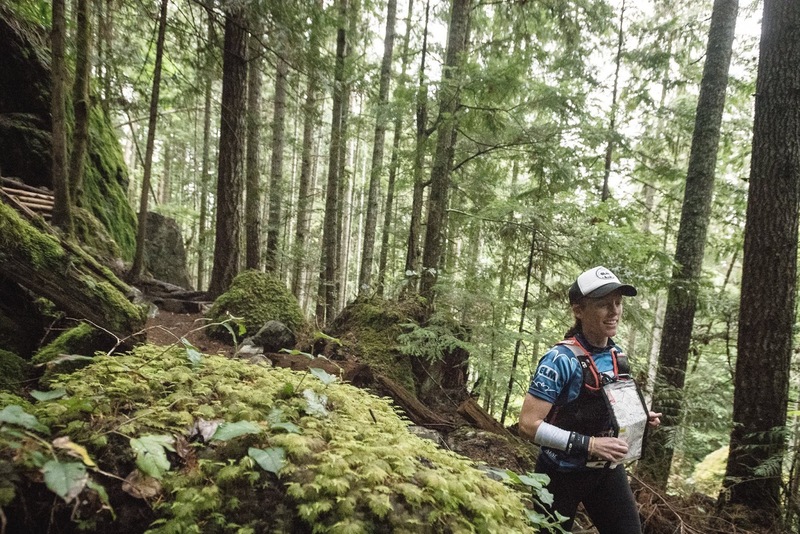 Navigation is my favourite part of Adventure Racing and why I fell in love with the sport initially- orienteering always makes me feel like a kid again! It went 80% well, but I got sloppy, tuned out and royally screwed up on one of the CP's, missing it entirely by losing touch with my map. I had to return to get it at the end, and sadly added on a full kilometre of extra running, out and back, as I had to retrace my steps to pick it up before heading back to the finish line. Ack! 5 or 10 minutes wasted there! My goal for every MOMAR is to run as clean a race as possible- with few to no mistakes. This rarely happens, of course, and so, just like those golfers, that is one of the reasons that I return over and over again. After paying for my mistake and collecting my last CP, I ran as fast as my tired legs could take me, through the streets of Cumberland and back to the park to finally cross the finish line. 5 hours and 15minutes later, I was happy, tired and covered head to toe in mud. It was a wonderful day:). Stoked to be the first solo woman but even happier that my body held up and let me enjoy such a fun and challenging day! The finish line zone is always a highlight as I get to share hi fives with race friends new and old and exchange fresh tales of wrong turns and flat tires and cramps and crashes and missed CPs and all of the other things we shoulda woulda coulda done out there, and all the while dreaming and scheming of next year. 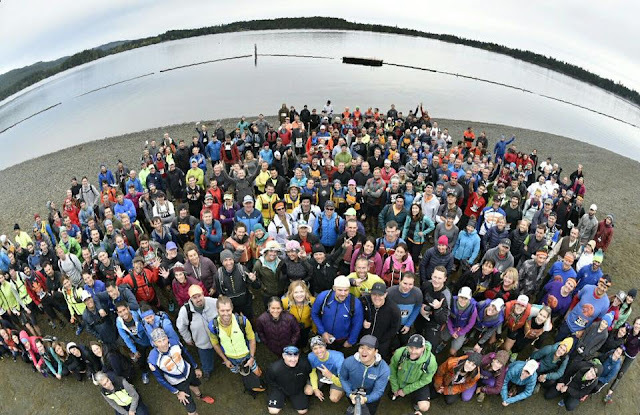 Eventually my lips turned blue and I couldn't take the shivers and shakes anymore, so I hopped on my bike and rode back out to the lake to load my boat on my car and head home for the final leg of the race...the banquet! Banquet and Awards: Helloooooooo Team ELM! It was SO awesome to see so many ELM athletes, leaders and MOMAR 101 students up on stage collecting top finsher awards in many of the categories! Short course, long course, male, female, the ELM family was well represented and there were plenty of high fives and hugs to be had! Well done! Another year, another great MOMAR. MOMAR is a community of some of the best people on earth. Adventure Racers are friendly, gritty, kind, adventurous and wild at heart spirits that love playing in the dirt, connecting with other humans and pushing their limits. They will push you forward and cheer you on while trying to beat you. They will stop racing to help patch you up if you fall. They will run around in circles for 2 hours and never give up. They will laugh when they want to cry. They would 'rather lose the battle than miss the war'. They are salt of the earth people and I am proud to call them my tribe. (Yah, you know who you are;). MOMAR makes you a ninja. Well, if you train for all of the disciplines it does! Multisport training including mountain biking, running and paddling keeps you strong, agile and powerful- and ready for any challenge! It is also easier on your body than specializing in one sport- by offering your body variety and decreasing the risk of overuse and repetitive injury. And, in case you haven't noticed, ninja's are really cool right now. A huge, muddy, sweaty, THANK YOU goes out to Mr. MOMAR, Bryan Tasaka, and his amazing team of organizers and volunteers who make this fantastic event happen year after year. So many great people out there I can't even begin to list them all!! Life would be pretty boring without you guys;). Thank you! Can't wait until next year! I made the exact same mistake on the bike, thinking the shorter route would be faster! So frustrating. A good race, though; I was pleased with how clean I kept it this year (other than all the mud). Sounds like we had a lot of the same experiences, but I was an hour and 20 slower than you. Next year! Hey Jordanne! Congrats on finishing your MOMAR too!! Such a hard but fun day:). What a mess it was back there on that muddy road lol! See you next year!